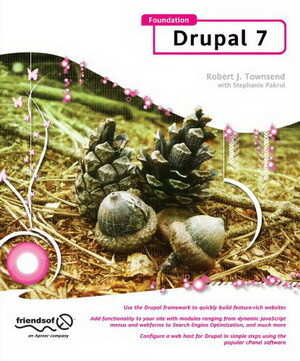 Friends of Ed, a division of Apress, has published “Foundation Drupal 7: Learn how to use the Drupal framework to quickly build feature-rich web sites” by R.J. Townsend, with a chapter on the Fusion theme by Stephanie Pakrul (aka StephTheGeek). Whether you’re an experienced Drupal site builder looking to expand your skills, a web developer or designer interested in learning Drupal, or a weekend hobbyist looking to build your first site, Foundation Drupal 7 will give you the knowledge and inspiration you need to bring your ideas to life. Significantly decrease the amount of time it takes you to code a feature-rich website. Understand how Drupal works and learn best practices to quickly integrate Drupal into every website you design. Learn how to configure a server and manage multiple websites and staging environments using popular server administration software (cPanel). Learn practical techniques to place Photoshop or Illustrator design files on a Drupal Content Management System. Have a reference manual and cookbook at your fingertips for help with CSS, popular Drupal modules, website recipes, code snippets and more. The primary audience for this book is web site designers interested in using Drupal to build web sites. The audience may have previous experience using Drupal but do not consider themselves proficient. They are familiar with coding a basic HTML/CSS web site, although these skills are not required to benefit from the book. R.J. Townsend became a Drupal convert in late 2006 when searching for a CMS for a project and his brother-in-law commented, “hey, have you checked out Drupal?” He has spent the following years singing its praises to anyone who will listen. R.J. has since built over 40 Drupal-powered websites for clients in a number of industries, including retail, business-to-business, non-profit, political advocacy, e-commerce, and higher education. With a passion for automating processes, research programs, and otherwise laborious tasks, Drupal has become his tool of choice. He currently works almost exclusively with agencies and freelance designers, providing consulting, development, training, managed hosting, and technical support services. Stephanie fell in love with Drupal back in 2005 as a tool to turn the ideas in her head into powerful websites. Her background in both design and web development were nicely bridged with this emerging field of “theming” — pulling together the visual design with the underlying functionality. She co-founded TopNotchThemes in 2007 to bring that expertise to site owners who seek the same thing that brought her to Drupal in the first place: turning dreams into reality without hiring a coder. Fusion and its line of free and premium Drupal themes have taken that goal a step further by allowing you to control the layout and styles of your site through Drupal’s UI.